Walter Sammons (1890 – 1973) was a inventor for an enhanced patent for the hot comb. Walter Sammons of Philadelphia, Pennsylvania received U.S. patent #1,362,823 on December 21, 1920 for an improved comb that straightened hair. According to Walter Sammons’ patent he invented a heated comb that removed kinks from the hair. The hot comb (also known as a straightening comb) is a metal comb that is used to straighten moderate or coarse hair to create a smoother hair texture. The hot comb was an invention original developed in France as a way for women with coarse curly hair to achieve a fine straight look traditionally modelled by historical Egyptian women. However, it was Annie Malone who first patented this tool, while her apprentice and former worker, Madam CJ Walker widened the teeth. The main function of the hot comb is to be heated and used directly to straighten the hair from the roots. 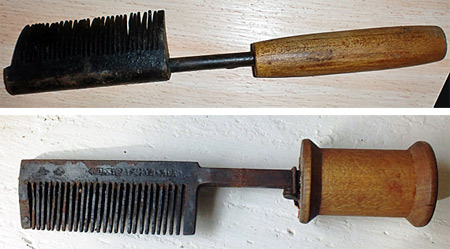 The hot comb was very good particularly for Afro hair who hair was coarse. There are different hot combs that have been created. The first hot comb was invented to be place directly on heat to get hot. It was placed directly on the cooker stove or on wood fires until now in 20th century it was finally replaced to be electrically heated. It is not uncommon, especially when using a traditional hot comb, to burn scalp or damage the hair. A hot comb is often heated to over 65 degrees celsius, therefore if not careful severe burns and scarring can occur. The hot comb that you use directly on the stove or on fires are different from the ones that you electrically heated as the coating of the hot comb is different and by using this particular hot comb in the original way can singe your hair. There are creams that you would use straight on the hairshafts to protect the hair when hot combing. When using the cream, the hot comb would produce smokes from the heat of the hair, the cream would seal the cream in the hair by making it shiny and healthy. Many African American and women of other races, still uses hot combs because of forming of straightening is temporary and less damaging to the hair if done properly. Today, hot combs are still used by many African American salons and families as an alternative to chemical hair straightening. After slavery the hot comb was a very controversial invention because many debated on whether it was beneficial or hurtful to the black community. There were some African Americans who believed that the hot comb damaged the African American community because it made the community submissive to the ‘white ideal image’ of beauty and disregarded African American culture. Others believed that efforts like hair straightening would boost their social and economic status. This mindset continued throughout the 20th century. Changing faces of hot combs, tongs, rods in the 21st Century. On their shoulder’s we stand!